The Congress benches led by Chief Minister Bhupinder Singh Hooda put up a spirited defence when Leader of the Opposition Om Prakash Chautala levelled several allegations against the government while speaking on the Governor’s Address in the Haryana Vidhan Sabha today. Zero hour in the Haryana Vidhan Sabha today witnessed two walkouts, first by the INLD and then by the BJP-HVP alliance, in protest against the rejection of their call-attention motions by Speaker Kuldeep Sharma. Yuichi Kamoshita, a Buddhist monk from Japan, started his march against the Gorakhpur nuclear power project today. The likelihood of early resumption of rail traffic suspended due to the pro-reservation stir by the Jats appears to be unlikely. Amardeep Jain, SDM, was despatched to Ramayan village of this district where the Jats have been squatting on both sides of the track for the past six days to assess the possibility of resumption of rail traffic in view of repeated statements by Jat leaders that they would ensure safe and smooth passage for all trains through the village. Five persons arrested in connection with the blasts at Jind in 2009 were not trained or professional terrorists, but had tried this modus operandi after becoming victims of blackmailing of religious sentiments by a cow shelter (gaushala) owner in Mewat. The owners of cow shelters in the district had no role in this incident and had not been under the police scanner or investigation, claimed district police chief Ashok Kumar. Most of the private schools remained closed in protest against the imposition of Rule 134 A providing for free education to 25 per cent students hailing from the BPL category. The Association of Private School Owners held a meeting and staged a demonstration here to denounce the government stand on the issue. In a significant direction, the Punjab and Haryana High Court has asked Haryana Chief Secretary to ensure timely payment of rent for accommodations occupied by judicial officers in the state. From a revenue-surplus state about three years back, the Hooda government is slowing going fiscal downhill with the state facing a burgeoning debt and huge revenue and fiscal deficit. As the sensational case of looting Rs 75 lakh from a jewellery showroom here on February 7 last remains unsolved, the police has decided to install CCTV cameras at important public places in the city. The project is likely to cost Rs 2.20 lakh and would be taken up on a priority basis. The Haryana Power Utilities have urged its employees not to participate in the proposed strike on February 28 for which notice has been served by the All-Haryana Power Corporations Workers Union having its head office in Hisar. A woman delivered a baby girl in the toilet of a hospital and fled after leaving the newborn in the bathroom on Wednesday night. As many as 185 new cases of hepatitis C were detected on the penultimate day of the survey by teams of the state Health Department and the PGIMS, Rohtak, in Ratia today. Two persons, bus driver Subhash of Kapurthala in Punjab and Nirmit Kaur, an NRI from Canada, died on the spot while six others were injured when a mini-bus of the Indo-Canadian Transport Company dashed against a parked tractor-trailer on the GT road near Gannaur late last night. Two constables were today placed under suspension in connection with escape of three criminals from a lockup at Hodal police station last night. Chautala tried to put the government on the mat on the issue of the special economic zone (SEZ) by alleging that while the government was seeking to get back its land from Reliance, it had left those farmers whose land was purchased by the company in the name of the SEZ, in the lurch. He wanted the land to be returned to farmers. Chautala alleged that the government wanted its land back from Reliance because of the Supreme Court’s judgement, which had said land acquired for a particular public purpose could not be put to another use. Since Reliance had dropped the plan to develop the SEZ on the acquired land, the government now wanted its land back. Intervening, Hooda said it was unfortunate that Chautala did not know the difference between “acquisition” and “purchase”. The government had acquired only about 1,400 acres for the SEZ, while the rest of the land was purchased by Reliance directly from farmers. On its part the government had not given any stamp duty exemption to Reliance as provided under the SEZ Act. Even the land was acquired during the INLD rule. He had a dig at Chautala when he said even Chautala had purchased land at so many places in the state and elsewhere. Chautala admitted that earlier he was in favour of the SEZ but not now. When Chautala alleged that government jobs in Haryana were on sale, Parliamentary Affairs Minister Randeep Singh Surjewala immediately pointed out that Chautala himself had been chargesheeted by the CBI in the JBT recruitment case. Even the entire Haryana Public Service Commission appointed by the INLD had been removed by the SC after its members were suspended by the President. Chautala retorted by saying that Om Prakash Jain had to be dropped from the Cabinet after his name figured in a job scam. Before Jain could offer his personal explanation, the Chief Minister intervened. He said Jain had quit the ministry on moral grounds, while Chautala had not resigned from the post of Leader of the Opposition though he had been chargesheeted by the CBI and had been summoned by the Enforcement Directorate under the Prevention of Money Laundering Act. Chautala did not respond. When the INLD leader alleged that the law and order in the state had worsened, Minister of State for Home Gopal Kanda, who was once a close associate of the Chautalas, alleged that several known criminals were constant companions of the Chautalas. He even named those persons. However, no one from the Opposition asked Kanda what was he doing to apprehend these persons though he was the Home Minister. Earlier, moving the motion of thanks, former minister Venod Sharma urged the government to reconsider the issue of setting up an industrial model township (IMT) in Ambala because the area was industrially backward. He said by not setting up an IMT in Ambala, about one lakh youth in the districts of Ambala, Kurukshetra and Yamunanagar were being deprived of employment opportunities. At the same time, he said, farmers should be paid compensation almost equal to the market rate of their land. Sharma said the Hooda government had done much more than what it had promised in 2005. It was because of this, the Congress again came to power in 2009. He hoped that the government would get the mandate in the next Assembly elections also. The motion was seconded by Aftab Ahmed, Congress MLA from Nuh. Immediately after question hour, Leader of the opposition Om Prakash Chautala urged the Speaker to first let the House discuss the law and order situation in the state, which, he said, was very bad. However, the Speaker said the members could raise the law and order issue while speaking on the Governor’s Address. He had admitted a call-attention motion on healthcare moved by Sampat Singh and Sumita Singh (both of Cong) and Abhay Singh Chautala of the INLD. The INLD members led by Chautala walked out of the House in protest against the Speaker’s decision. Leader of the BJP Legislature Party Anil Vij also wanted to know the fate of his two call-attention motions, one on the SEZ and another on the need to increase the salary of policemen. When the Speaker did not allow him to speak, he along with other members of the BJP and the HVP walked out of the House. Yuichi Kamoshita, a Buddhist monk from Japan, started his march against the Gorakhpur nuclear power project today. Today was the last day for receiving claims to compensation and objections to the measurements of land acquired by the government for the setting up of the Gorakhpur Atomic Power Project by Nuclear Power Corporation of India Limited (NPCIL) in the village. Kamoshita, who has been living in a Buddhist temple in Nalanda (Bihar) for the past six years, started his peace march in support of farmers sitting on a dharna against the project for the last 563 days. The peace march started from the Gorakhnath Dham in Gorakhpur village and will culminate at Rajghat in New Delhi on March 11, the first anniversary of Fukushima nuclear disaster in Japan. “Over 20,000 persons had died of earthquake and tsunami in Japan last year, but the devastation caused by the March 11 nuclear explosions in Fukushima due to tsunami is much more and will have its ill effects on the people for generations to come,” said Kamoshita. He said the radiations of the nuclear disaster in Fukushima has vitiated the water, air, soil and skies of that area and the local people in Fatehabad would also be exposed to similar perils, if the government went ahead with the project. He said when a country like Japan, considered technologically sound, could not save its people from the disaster, what could be expected from the Government of India, where corruption breeds in the system. Mahabir Tyagi, president of the Haryana Pradesh Sarvodaya Mandal, the NGO organising the peace march, said in all 11 members, including a US woman, were part of the march. Meanwhile, Hans Raj Siwach, president of the Kisan Sangharsh Samiti, led a deputation of farmers opposing the acquisition of their lands to District Revenue Officer OP Verma. Siwach said farmers had threatened the authorities that they would commit mass suicide, in case their lands were acquired. Verma said he had asked farmers to give their representation in writing, so that it could be forwarded to the government. Earlier, Chief Parliamentary Secretary Prahlad Singh Gillankhera had led a group of farmers to Chief Minister Bhupinder Singh Hooda in Chandigarh yesterday expressing their support for the project. However, as it turned out there was no consensus among protesters on the issue. While leaders appeared keen on resumption of rail services, young protesters hooted the proposal down. Meanwhile, the indefinite fast by four members of the community entered its second day today. Hundreds of protesters continued to squat near the rail track. All eyes are now on tomorrow’s scheduled talks between government representatives and the 11-member panel of the Jat community. The talks are scheduled to begin at 12 noon tomorrow at the Power Grid Corporation of India’s office in the village. He said none of the gaushalas in the district was being probed for their alleged involvement in a blast that shook a mosque in Jind. He said while five persons had been nabbed, it was perhaps one of the accused identified as Sagar, alias Azad, of Uchana, who had been proactive in the case, due to the fact that he had been working with some of the cow shelters and had been opposing the activity related to cow smuggling and slaughter by a community. Admitting that the accused had been allegedly involved in the blasts at Jind two years ago, he said the investigations had revealed that these youths only wanted to create some panic among the cow smugglers in the region and had not targeted to harm or kill anybody. 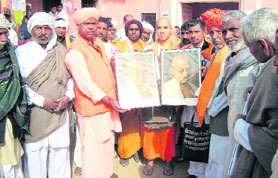 Kumar said while there was no proactive terror outfit under then name of the Azad Sagthathan in the district, the police would be interrogating one person identified as Acharya based in Mewat , who had perhaps instigated and motivated Sagar and his friends to carry out the blasts in the name of saving the cow and religion. He said initial investigation revealed that the cow shelters or their heads in the districts had hardly any role in either instigating or helping the accused to carry out the blast at any place in the state. Meanwhile, it is revealed that another accused Gurnam Singh of Palwa village was earlier arrested in connection with the blast that took place in the office of the truck union office at Safidon town on August 25, 2011, along with another accused Kismat Deswal. Though the duo had been remanded to three days police remand in that case, Gurnam was released on bail as the police failed to produce a challan. It is claimed that if Gurnam had been interrogated properly, the case of the blast at a Mosque here in 2009 could have been solved in September last year, itself, according to police sources. It was at that time that names of other accused, including Sagar and Pawan, had surfaced and the police had to declare them as absconders since then. The police had put the case of investigation of the mosque blast on back burner after it failed to make any headway at that time. The arrest of the five accused at Patiala has now given a new lease of life to the case. Most of the private schools remained closed in protest against the imposition of Rule 134 A providing for free education to 25 per cent students hailing from the BPL category. The Association of Private School Owners held a meeting and staged a demonstration here to denounce the government stand on the issue. Serving an ultimatum on the government, the association threatened to intensify the agitation if the demands were not met by March 20 . Claming that this rule would force the closure of many private schools in the state, a spokesman of the association claimed that it was not possible to pass over the financial burden accruing from this move to the remaining three-fourth students as these institutions had not been getting any grant or financial help from any source, including the state or the union government. 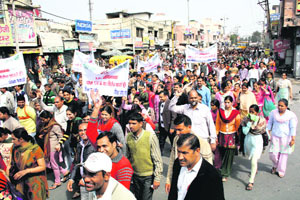 “If the government wanted this concept to be a success without hurting the financial standings of private schools, it should have made a provision for reimbursing the fee and other charges of BPL students as in the case of government schools’’, observed Mr Jitender Lathar, president of the association. He said a majority of the schools faced closure if the government had its way. Demanding withdrawal of the notification for implementation of Rule 134- A, members of the association took out a protest march before submitting a memorandum to the Chief Minister through the Deputy Commissioner. Other demands include recognition to all private schools and relief in taxes on school buses. Hisar: Most of the private schools in the city remained closed on Friday in protest against the implementation of Rule 134 A. A spokesperson for the school managements said the rule, if implemented, would spell financial doom for the schools. He said they would be forced to raise the fees which meant that the parents would have to bear the fees for poor students. He said this was a peculiar situation and a solution had to be found soon. Sirsa: The All-India Students Federation (AISF) on Friday demanded cancellation of government approval to private schools denying 25 per cent seats to the poor even as private schools remained closed against Rule 134-A of the Haryana School Education Rules, 2003. Led by Roshan Suchan, state convener, AISF activists gave a memorandum to the DC addressed to Chief Minister Bhupinder Singh Hooda and Education Minister Geeta Bhukkal demanding stern action against schools creating hurdles in the implementation of Rule 134-A and the Right to Education Act. A status report by the Department of Administration of Justice on requisitioned houses for the judicial officers, and the payment of rent, has also been called for. The high court also fixed two weeks deadline for the purpose. The directions assume significance as the judicial officers, putting up in rented accommodations, are often put in an embarrassing situation due to the failure of the state government to ensure timely payment of rent. Taking cognisance of the issue, a Division Bench of the high court minced no words to say the judicial officer in the state is asked to take a house on rent, only to find the government defaulting in paying the rent, and the same being demanded from the officer concerned. The Bench headed by Justice MM Kumar also quoted the example of Faridabad and other cities to substantiate the contentions. In its detailed order, the Bench asserted: “The cognate issue which has arisen for consideration is that till the time the houses are constructed for the judicial officers, they have to be provided hired accommodation. “The practice in the state of Haryana is that the officer concerned is asked to take a house on rent and the government usually commits default in making payment of rent. It becomes embarrassing for the occupants of the house because the demand of rent is ordinarily raised before the officer concerned. “In Faridabad and other places also, the rent is not being paid regularly. Therefore, we direct the Chief Secretary, Government of Haryana, to ensure that the rent is paid regularly without causing any embarrassment to the Judicial Officer. “A status report with regard to the requisitioned houses for the judicial officers in the state of Haryana and payment of rent shall be filed by the Department of Administration of Justice within two weeks.” Before parting with the case, the Bench also fixed March 15 as the next date of hearing. In a pointer to the sorry state of finances ahead of the state Budget next month, the latest CAG report has pegged state’s debt at a whopping Rs 46,282 crore in 2010-11 financial year — a substantial increase of 18 per cent over 2,009-10 (Rs 39,337 crore). Not only this, the revenue, fiscal and primary deficits are reported to be Rs 2,746 crore, Rs 7,258 crore and Rs 3,939 crore, respectively. With salaries, pensions, interest payments and subsidies accounting for about 88 per cent of the non-plan revenue expenditure in 2010-11, the situation is not likely to improve in the near future. In fact, nearly 90 per cent (Rs 2,949 crore) of the total subsidies (Rs 3,285 crore)go to the power sector, which is already in a fiscal mess against the backdrop of the discoms being in the red. Pointing out another instance of wastage expenditure, the CAG report asserted that the investment in statutory corporations, joint stock companies and cooperatives increased by 14 per cent in the last financial year over the previous year while the return on these investments was less than 1 per cent. Meanwhile, Onkar Nath, Principal Accountant General (Audit), alleged that various departments had not submitted utilisation certificates of loans and grants taken from various agencies amounting to Rs 4,705 crore for the completion of projects. Police spokesperson said 40 spots had been identified where the CCTV cameras would be installed. He said the proposal to install these cameras had already been sanctioned by the state police headquarters at Panchkula and the work would be started soon. The points where such cameras would be installed include Shiela Bypass, Bhiwani Stand, Delhi Bypass, Jhajjar Chungi, Bhiwani Chungi, Sukhpura Chowk, Hisar Bypass, Jind Bypass, Sunarian Chowk and D-Park. All these cameras would be attached to the control room at the SSP office where cops would be able to keep a track of the movement at all such spots round-the-clock. Besides the public places, all the police stations in the city and the district would also be brought under the CCTV surveillance. An official spokesman said power supply was covered under the provisions of the Essential Services Maintenance Act and workers should watch larger interests of the citizens. He stated that the government had already sanctioned one of the highest scales and salaries to employees of the Power Department. None of the major demands of workers was pending, he added. He further stated that the utilities had already started the process to fill over 5,000 technical and non-technical posts. The baby is reported to be healthy and safe and is lodged in ward number two of the hospital under the care of the Jan Sewa Sansthan, an NGO. The local police has collected the CCTV footage to identify the mother of the child after a complaint was lodged by the NGO. The newborn was found lying on the floor of the bathroom of the Emergency Ward by a woman who had gone there around 9 pm on Wednesday night. “The teams took 513 samples from 16 villages of the area and 395 samples from the urban area of Ratia town,” said Bharti Sharma, epidemiologist, Fatehabad. As many as 95 fresh cases have been reported from Ratia town today. Dr Ramesh Verma, associate professor of the community medicine, PGIMS, Rohtak, appealed to those left out for the tests to visit the camp set up at the community health centre in Ratia on the last day tomorrow. The mini-bus was on its way to Ludhiana from the Indira Gandhi International Airport, New Delhi. Harpreet, Puran Singh, Preetam Kaur, Pawan, Dhoop Ram and Charanjit- all from Punjab, were referred to the PGIMS, Rohtak, after preliminary treatment in the local civil hospital. An FIR has also been registered against them. The constables are Abdul Zabaar and Fazruddin. The three criminals, Shahun, Shahbuddin (from Mewat area) and Fakru (Rajasthan), are members of an inter-state gang.